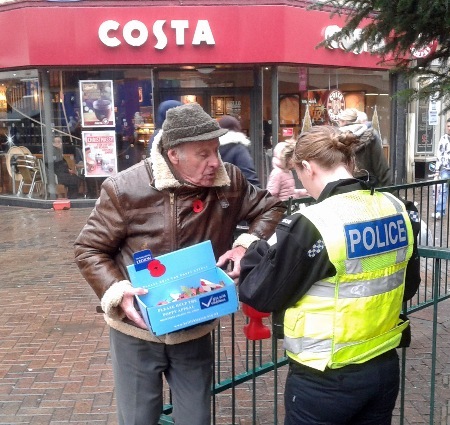 NINE MVs and their owners helped the Royal British Legion sell poppies in North- ampton town centre for Operation Poppy 2016. On Saturday, November 5, we had five Jeeps, an Austin K9, Standard Flying 10, Bedford MW and Harley Davidson MT350. Rain and other commit- ments reduced this on the 12th to two Jeeps, the MW and the Harley. The second fund-raising day was enlivened when Roy Sharman’s Jeep tried to eat a police car. To be fair to the Jeep, it was parked at the time and the police car was the one that was moving. Needless to say, the Jeep’s front fender wasn’t scratched but the Astra police car had two parallel grooves gouged in its side. Much apologies from the boys and girl in blue followed, together with a fair bit of form filling. The paparazzi was there to photograph Roy helping police with their inquiries. The total raised over the two days was £1,832.33. Jim Poole collected £624.56, Peter Clarke £359.27, Paul Taylor £286.13, Roy Sharman £230.35, Heather Bailey £61.13, Neill Elliott £48.92 and Richard Hall £29.42. Some members didn't put their names on tins, so were not recorded. Roy Sharman helps police with their inquiries after his parked Jeep savaged a moving police car. Result: Jeep 1, Vauxhall Astra 0.